What is the solution for Saving and Empowering African Kids Lives. Empowering Women. Because Kids are dying from Treatable/Preventable diseases, and we saw that an answer was giving access to public healthcare for kids, we build East Africa’s 1st public kid’s hospital. Program Design and implementation; from the initial stage in 2008 to opening the doors in 2015 it was hands on the ground a ‘Kenya project’. Local workers, local architect, local contractor, working for the Kenyan people. Program auditing; an independent Kenyan team, who had come to the US for training and with experience delivering projects for USAID and PEPFAR, carefully audited each step of the way. Constant monitoring and evaluating, careful on-going cost cutting following the research of four years project development before the implementation initiated. Program Well-being; Kenyan Doctors and a Kenyan Shoe4Africa board work with Shoe4Africa USA to maximize improvements as we scale up to save more lives. Charities are often Asked; “Is it needed?” Yes – The USA has over 157 kids hospitals with 320-million citizens. Why would Sub-Saharan Africa have only one public children’s hospital for one billion people? 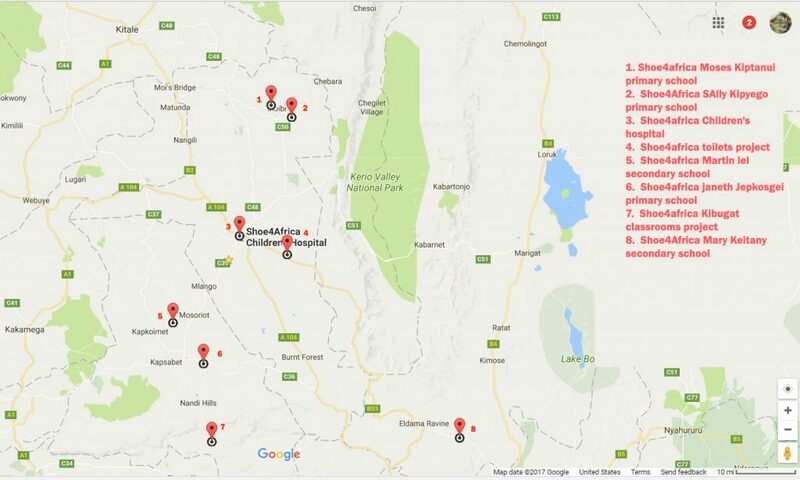 Ours, in 2015, was Sub Saharan’s 2nd, with the Nelson Mandela Hospital in 2017 down in South Africa now being the third. “Is your model effective?” Yes – we are seeing over 100,000 poor patients per year, and impacting a far greater number, with jobs, training, and outreach. “Can you scale?” We are; in our first year we were able to treat a far smaller number. We can also copy our model, that delivered under budget and on time and with two year project management fees including all travel for around $15,000 USD for a multi-million dollar project. “Do you create jobs?” Absolutely. Hundreds of people have been hired because of our initiatives. “What is Shoe4Africa’s exit strategy?” Every project we have done in Africa was built for us to exit and to be fully self-reliant; that is our model. if we die tomorrow nothing will fail; all will continue. Our existence just brings more positive change. Our projects are 100% locally owned. All the people who work with us on our projects in Africa are African. We have a (very) strong presence on the ground based on trust on what we have done over a twenty year+ history. We believe in a holistic approach to solving issues that is flexible and changeable to the best and latest trends. Health: We were happy to read in print what we believed to be true: Nick Kristoff noted that access to healthcare was the biggest disruption of addressing the trend of better mortality rates. (source). There is an absolute health crisis in East Africa, rather than scream to deaf ears that 1 out of 8 kids is dying before their fifth birthday as has been the case for years, we are providing a solution that works. We knew to make an impact we had to get the child through the hospital doors and be the priority. With no public children’s hospital for an area of over 250-million we knew there was a major problem. The outcome – We built a public kids teaching hospital. 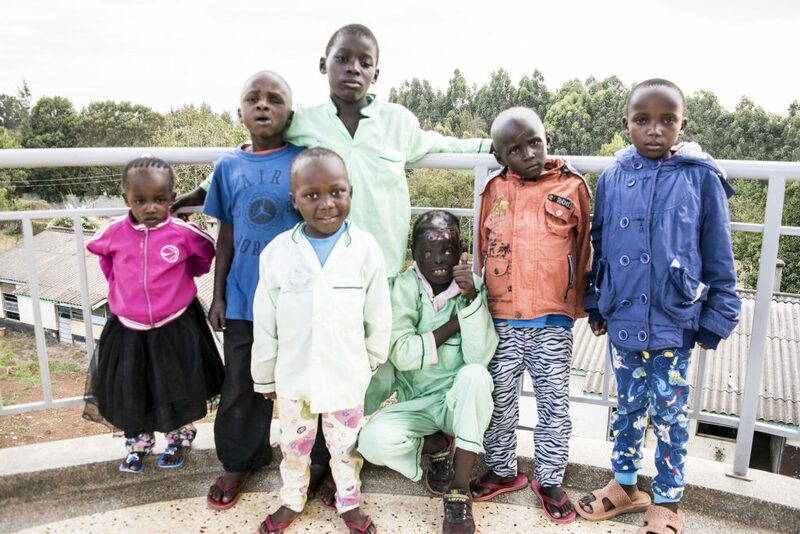 Now thousands of kids getting quality healthcare, mothers traveling from all over Kenya knowing that their child will be seen and treated in a timely, dignified, and respectful matter. Today, on average 318 kids are being treated in our child-only public hospital per day — that is 318 x 365-days = 116,070 per year. The first time in history this has happened in East & Central Africa. Are child mortality rates changing for the better? Yes! During May 2018 we questioned every out-patient mother; nobody had waited longer than one hour before having their child treated! Are we finished? No. Now we enter phase two, working on a swifter turnover of patients. Better equipment. Improved services. Teaching prevention, offering screenings. Reaching kids in an earlier stage of their illness. Motivating Docs/Nurses to raise the bar. Constructing ancillary buildings. Opening a Music Therapy House. Initiating a child education unit in the grounds… and more. Our Great Gregarious Goal? A huge problem is Childhood Cancers in East Africa. We plan to replicate our success by building the first Kids Cancer Hospital in Sub Saharan Africa upon the same sustainable plan we used for our general children’s hospital. Our immediate impact will be at once saving 350 -kids lives according to Dr. T. Vik with our evaluation studies more than tripling this number within three years. We focus on three pillars. An overview of our work. Hospitals: We’re bringing life-saving medical care to a catchment area of over 10- million children in East Africa. Built public children’s hospital (only 3 in Sub-Saharan Africa) – today running at full capacity. An accredited Teaching Hospital, with ISO 9001:2008 certification and a partnership with Kenya’s 2nd largest university. Our first hospital budget was slated at $6m+ and took seven years of planning, endless fund raising, and total commitment. We opened its doors on August 12th 2015. We started with nothing but a couple of donations that surmounted to less than $220 in the bank for the project in April of 2008, and had absolutely no employees but through sheer determination and will, we overcame tremendous odds, stayed the course, and built this new top-notch hospital and staffed it with a great medical team so that an immense area of covering millions could receive the healthcare they need. Future: Upon completion we intend to build the 2nd public kids hospital in East Africa by 2022 so that we can serve another 6-8 million Africans. Design work is just beginning; donations will be sought after we’ve completed fund-raising for the cancer hospital..
Shoe4Africa’s humble beginning’s started with the belief that anyone is capable of anything if they have the opportunity. It started with the idea that shoes were a basic necessity to avoid disease and to walk to school. The problem we found was that schools were either dilapidated or non-existent so we began to right this wrong too. In 2010 we opened our first school and we now have around 1,600 kids getting free quality education in our Shoe4Africa schools. Each school is brand new, staffed with great teachers, and is hooked with a local world class mentor. We also introduce laptops and e-readers so these beautiful children learn in a traditional sense as well as keep pace with the developing world. Future: We are focusing on building schools within the hospital catchment area so that our brothers and sisters can take the Big Steps Forward to a healthier, more educated, and self-sustaining community. Dr.Kibosia, who helped revolutionize public health in Kenya, states that early education is critical and the basics of health education can be immense in saving lives; we listened and want to bring all our students to the Hospital for early training! We expect to build 10 additional schools between now and 2025. Donations, from small to a (complete) school, will make this dream happen. We invest the money we raise into projects that we ourselves oversee and direct- we never pay another “team” of partners on the ground (that doubles the costs). Our team thus makes sure, firsthand, that every dollar is accounted for and we audit, and are audited, every step of the way. Education: Half of the youth in Sub Saharan Africa are out of school (worldbank 2015). And an estimated 31 million girls of primary school age and 32 million girls of lower secondary school age were out of school in 2013 according to UNICEF 2013. Clearly education is the foundation of progress and it is sorely needed. Empowerment: Most of the billion+ people in Africa have never seen the outside world nor been influenced by its progress. We focus on creating new knowledge AND belief in one’s ability through programs that empower Africans to learn and take greater control of their lives to make a better future for them, their families, their community, and the world. See more…. Our Project Makers Are Our Heroes – Thank You! There are tons of ways you can get involved with our projects, from holding a lemonade stand (thanks Miss Sharp), to a basketball tourney (thanks Alex Sweeney), to running with us (thanks Team Shoe4Africa! ), to playing tennis with us (thanks Zee), to a simple $10 donation (that’s three school books! ), to knitting teddy bears for patients (thanks Loredana)… and the more You, the kind donors, have made Shoe4Africa happen… and with you we can make miracles happen. 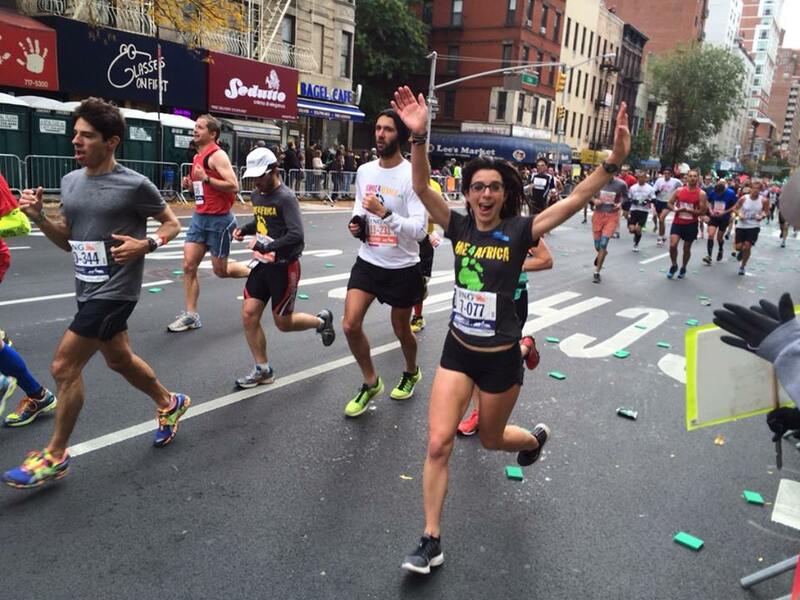 Melina Buck who has ran for Shoe4Africa seven times in the NYC marathon; thank you! We are powered by Donors. Donors are our partners and as such deserve that all funds make the biggest impact possible. Every single dollar counts; don’t think your donation won’t make a difference, it will. What we don’t do – pay anyone a six figure salary. In fact the total of all our salaries are less than $50,000 after tax. We don’t have an office in NYC – we work from our apartments to save costs. We don’t pay other charities (‘partners’) to do the work we do as many ‘middlemen charities’ are starting to do. Else wouldn’t it be more honest to just tell you to donate directly to that partner that they (obviously) trust and spare the inefficiency of double-pay? What we do? Critical work; Save African Kids Lives. You can help in many ways. Sharing our story – maybe you are in the health/education world, maybe you know someone in a foundation (maybe you are in a foundation). Introductions are the beginnings to wonderful journeys. Of course plain and simple donations work great (hit the red donate button), and there is a campaign funding – starting a campaign is a perfect way of you joining the journey with us. Start a Campaign using our totally secure website. It literally takes two minutes to set up a campaign and we will customize the amount you wish to raise. Have a look at a campaign SEE HERE (this one is running a half marathon but it could be for anything, biking, juggling, a birthday) to get an idea. eMail Us and we will get you started. Tell people why you are helping Shoe4Africa. One partner told his friends, ‘I was truly fed up by overpaid charity workers saying they were helping my fellow Africans. So I looked into Shoe4Africa. Turns out my uncle, Peter Njenga, had taken his daughter to this charity’s hospital. He gave me the thumbs up. They are truly saving lives daily. I checked out a number of other charities and the bottom line was this charity works. Shout about it – send your page to all your friends, your Facebook, LinkedIn, Instagram, twitter friends, your spouses friends, work friends – everywhere! Ever thought your donation won’t make a difference? 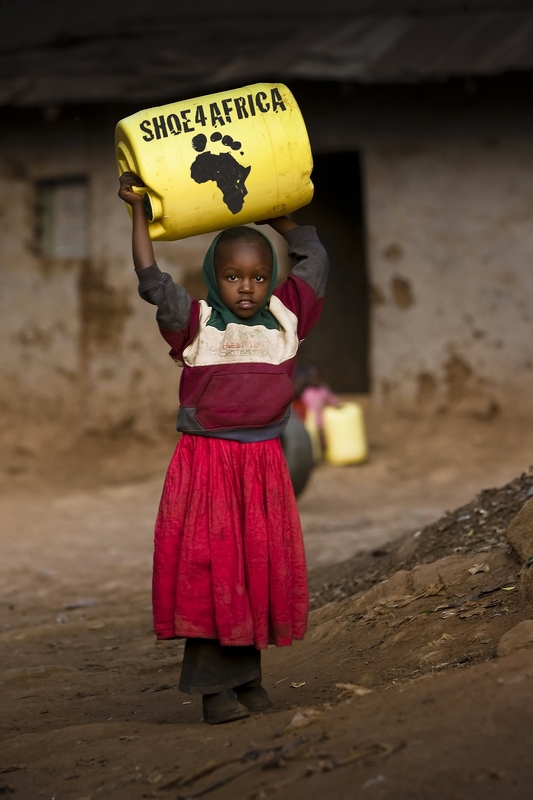 Think again and join Team Shoe4Africa. Please be the voice for these kids; they need you! “There are countless charities to choose from, and many do good work. But a precious few can say they dramatically improve or save people’s lives in a cost-effective way, and then back up their claims with hard data.” N. Pitney. The Shoe4Africa foundation, through the Children’s Hospital and through its public schools, is making a dramatic difference in the lives of many African kids. Every Shoe4Africa project has been built in a sustainable and extremely cost effective fashion. WHO: Young adults who are passionate about Saving and Empowering African Kids lives. HOW: Gather your friends and make time to start this project. WHEN: No better time than right now! Thank you so much for your interest in starting a chapter and to be on the Shoe4Africa network. Find a related club at school/community and partner with them! Try and challenge another school or college, or a series of schools! Our German chapter found that the whole school got involved, the sports department, the head teacher, parents and kids and they raised a ton of money with sponsored laps! Princeton University holding a color run for Shoe4Africa! Social Media Stars! Social media is really important to Shoe4Africa, it is our voice to the community. It allows us to introduce shoe4africa to those who otherwise would never know about us and our programs. It allows us to increase our donor base, which greatly impacts our ability to provide better programming to the scholars. For all, and for everyone. Get Involved — along side us! Host a Project Meeting, group run, or an intimate event in your city about Shoe4Africa, and we will see if we can get our Founder and CEO, Toby to come.